I've made an escalator, and I want to make it expandable (i.e., cover a greater distance, and add more bones/stairs as the distance is incrementally increased). Each stair is attached to a bone, and the bones follow a curve that defines the stairs' path. All stairs/bones were added individually. I've added an incremental custom property and shape key with driver to expand the curve, but I don't know how to add a bone and a stair for each incremental increase in the custom property (or get rid of them as the custom property is decreased). 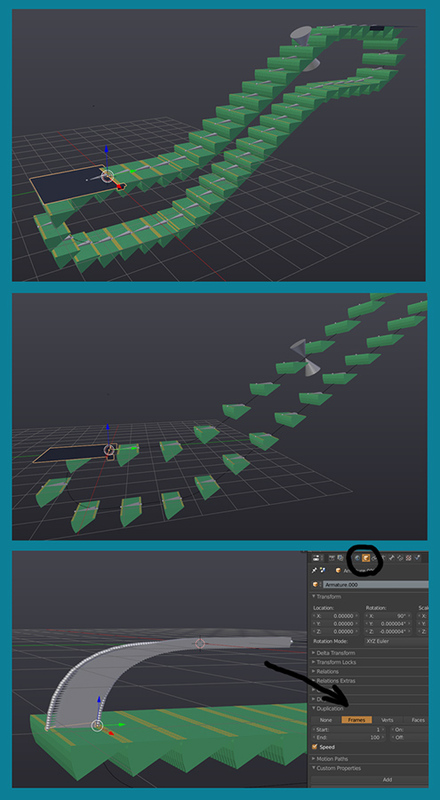 Obviously, there's no Modifiers>Array feature for bones, and creating an array of stairs (and the Duplication section of the bone's Object Properties tab) give the results in the bottom picture. Thanx in advance to anybody who can help. Browse other questions tagged modifiers bones or ask your own question. Can I use Nurbs curves as the bone display custom shape? How can I create vertical posts that follow a landscape?